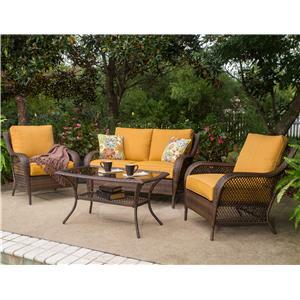 The pieces in this chat set boast a rustic, twig-like weave along the sides and high back, finished with curved arms, tightly woven trim, and a semi-sheer woven base. The natural patterns are highlighted by a tan shade, and offset in the tables with a glass top, and chairs by plush, all-weather fabric cushions. The wicker is maintenance-free; simply hose it off each season to keep it looking like new. The Rectangular Dining Table has a transitional style with modern clean lines and turned legs creating a timeless piece. Take advantage of the umbrella hole to provide shade on a sunny day. 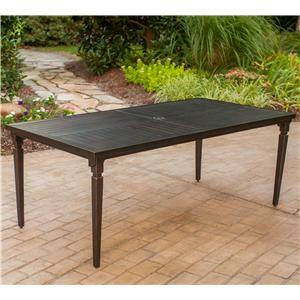 Pair the Table with the Dining Chair to create the ideal outdoor dining room. The sleek and classic design of Agio’s Monterey Collection swivel balcony chair facilitates a unique moment of respite in your day. Characterized by a frame of sweeping curves, like brush strokes on a canvas, this chair is constructed out of finely extruded aluminum. With fully welded arms built for maximum strength and durability, it is elegantly designed to withstand both rust and harsh weather. 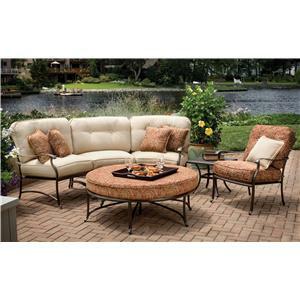 Sit back and relax in the beautiful outdoors with the Semi-Round Sectional Chat Set. The curved sectional wraps around the ottoman just right so everyone can use the ottoman and put their feet up. The aluminum base and thick cushions with throw pillows gives you comfort that will last for hours. 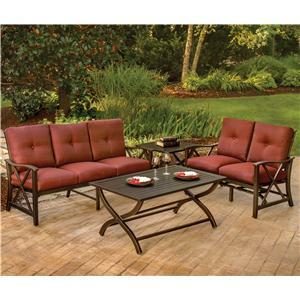 Invite friends and family over and entertain them with the Semi-Round Sectional Chat Set. 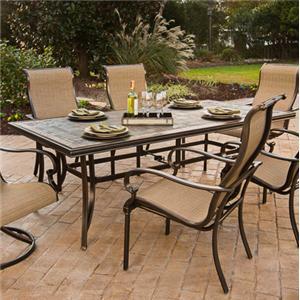 The Monterey collection's five piece sling dining set, sets the standard for a clean, comfortable, and stylish outdoor living space. Its softly-hued extruded aluminum frame will withstand weather and rust for many years of enjoyment. Take your dinner outside and relax with the Sling Dining Chair. The sling styled seat and arms provides comfort to last for hours. Beautifully detailed aluminum framed finished in a rich bronze. Pair the chair with the Stamped Top Dining Table. 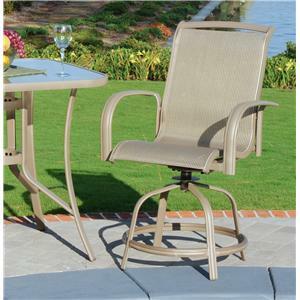 Create an inviting meal space with this outdoor gathering height swivel chair. 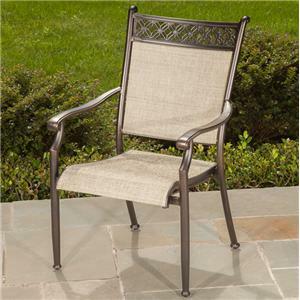 The traditional design features elegantly scrolled armrests and a basket weave cast back for beautiful style. Seat pad is covered in a soft Sunbrella® speckled tan fabric for extra comfort with resistance to mold, mildew, and sun fading. 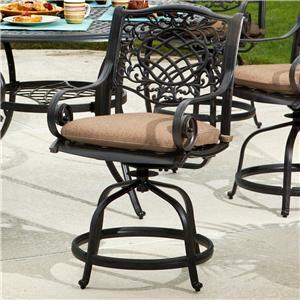 Crafted from a sturdy rust free Alumicast frame in a black powder-coat finish for long-lasting durability and beauty. Pair with the matching gathering height table for the complete set. 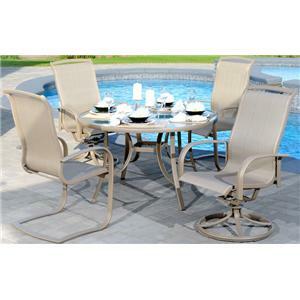 Spend quality time outside with friends and family in the Aruba 4 Pc. Wicker Chat Set. Without over powering your space, the set is just the size to easily seat four people. 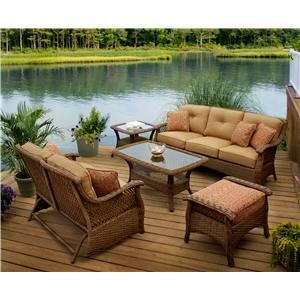 The thick cushions, deep seats, and smooth wicker arms bring a new level of comfort to the outdoors. The cocktail table features a glass top making it easy to keep clean and a place to set down drinks. The chat set brings a pop of color to your outdoor space and features fun accent pillows creating a welcoming setting. Gather friends around to spend a night out under the stars. Sit back in the comfortable sofa and loveseat with thick cushions and smooth arms. The large coffee table and square end table complete the set proving space to set down drinks, appetizers or the good book you are working on.